Vape Juice is a product that comes with many different names including E-Juice, Vape Juice, and Vapor liquid. The product is used in a wide variety of vaporizers, and is available in a large variety of flavors. Vape juice is available in many different flavors to suit the preferences of each user, and they can come with many different nicotine levels. There are Vape juices that contain zero nicotine as well. The products are made up mostly of vegetable glycerin (VG) or propylene glycol (PG). Some additional ingredients are also added to improve the vape juice such as water, food flavoring and some forms of nicotine. Some of the most popular types of Vape juice that you might find include Ice cream flavors, ketchup, cookies, brownies, jolly rancher, mint and more. 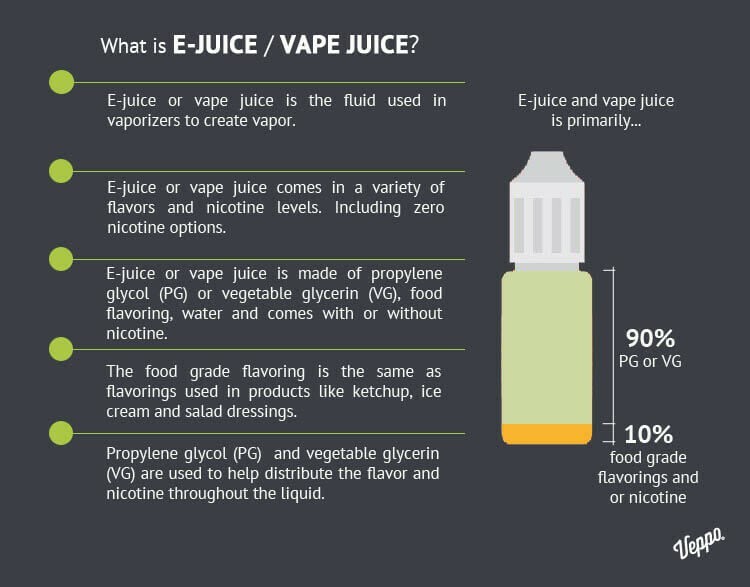 Around 10% of the ingredients in vape juice are the flavorings as well as the nicotine and other food-grade products. 90% of the product after that is a PG or VG fluid that is the medium to evaporate these ingredients for safe consumption. Vape juice can often contain different ratios of VG or PG. PG is one of the main ingredients in e-liquid or vape juice. PG is considered one of the most popular for refills as well as for consumer products. It is a humidifier, and it delivers a strong vapor for use in some pharmaceuticals, vape juices and food products. PG works as an alcohol, and it's odorless with a faintly sweet taste to it. Many people link the ingredients of PG to antifreeze and other products, but the truth is that it's only one small ingredient in a product like antifreeze. Pros: PG is generally safe for inhalation or swallowing. Only a small percentage of the population are affected negatively by PG use. Around .8-3.5% of the population are classified as allergic or sensitive to this additive. [citation required] It can often be far more discreet for use in public. Cons: PG can produce less visible vapor then VG, so it isn’t ideal for massive clouds. Vegetable glycerin generally makes up 80 to 90% of vape juice. Many producers substitute this product because it typically delivers bigger, denser clouds of vapor which are popular amongst users. VG is an entirely non-toxic liquid that colorless and contains no smell. VG is an alcohol, and it is manufactured without using any oil products. This is an entirely vegetable-based product. VG is a newer material, and some of the older vaporizers may experience difficulty with their atomizers trying to produce vapor with this vape juice. VG is also an ingredient in many different types of medicines, and it's had studies published on the long term effects. Pros: Better for producing a large vapor. Cons: Doesn’t leave the same lingering flavor. Can be sweeter for almost every flavor. Can clog up older and smaller atomizers. The delicious taste that can be found in every type of Vape juice comes from food quality ingredients. The bases of VG or PG don't have much flavor on their own, but when mixed with a few food additives it can be possible to produce a robust flavor. The industry is working to eliminate a series of additives that have been proven to be safe to eat but not inhale [we should be specific about what additives should be avoided rather than just saying “a series of additives”…that doesn’t help the reader know exactly what to avoid]. Vape juices containing diacetyl, for example, are being taken off the market [what others?]. Flavors make up a small percentage of vape juice and add flavoring to the vape juice to create different styles. Food safe flavorings can be combined together to simulate flavors like birthday cake, cookies and more. Most top vape liquids will contain some form of nicotine. It can often be a flavoring that can satisfy some of the nicotine cravings and without having to use any tobacco leaf. Nicotine can often improve the flavor of a throat hit with e juice. Nicotine can be considered a reasonably safe drug [citation required]. It is the added smoke caused by burning tobacco from cigarettes that is responsible for causing harm. There's less of a chance of harmful effects from vaping [citation], so it remains one of the safest ways to inhale nicotine. Although there are no long term studies on the effects of vaping, smoking contributes to nearly 100,000 deaths in the UK each year. Regular water is used to reduce some of the potency of the flavors that can be found in vape juice. For a liquid to produce a lingering vapor, there needs to be at least some form of water to mix with the PG or VG and flavoring. Vape juice will often use small amounts of water to dilute the juice adequately. How to choose an E Juice? Choosing an E Juice that suits your immediate needs often comes down to the idea of goals with your use of a vape. Most of the time when selecting E Juice, it comes down to flavor, quitting smoking (nicotine substitute), or producing maximum vapor. If you are purchasing an E Juice liquid specifically for the taste, you may want to experiment with several different flavors before you settle on your favorite. Keep in mind that PG blends are often some of the most flavorful. Combinations that have high nicotine content can also produce more flavor because they can offer a stronger throat hit. Having a lingering vapor that also contains a powerful hit on the draw can help keep a taste lingering over time. Be sure to try out many different types of exotic flavors so that you can find a product you love to vape with! Quitting Cigarettes: if you have decided to try quitting cigarettes, you can try getting a high nicotine vape juice blend. Choosing a vape juice that also contains a high degree of nicotine and then slowly working to cut your nicotine dosage can help you to satisfy your cravings while eventually going nicotine free. Vape juice can be one of the most effective ways that you can quit smoking and finally quit nicotine altogether. Just switching over to a vaporizer can be a much healthier choice. The smoke from tobacco is the main cause of the number of poisonous issues and health concerns over time. Quitting cigarettes with the help of a vape can be an excellent way to improve your health and reduce the chance of health concerns. Getting the largest clouds: There are also many people that experiment with vape mods. Choosing a vape mod that can produce the largest vapor clouds for vape tricking is a popular past time. Opting for a VG blend of vape juice can often be one of the best ways to get the biggest clouds. Choosing a sweeter flavor can often enhance the size of the cloud too. Try experimenting with a few different VG blends and a high heat atomizer if you want to get really dense vapor clouds. 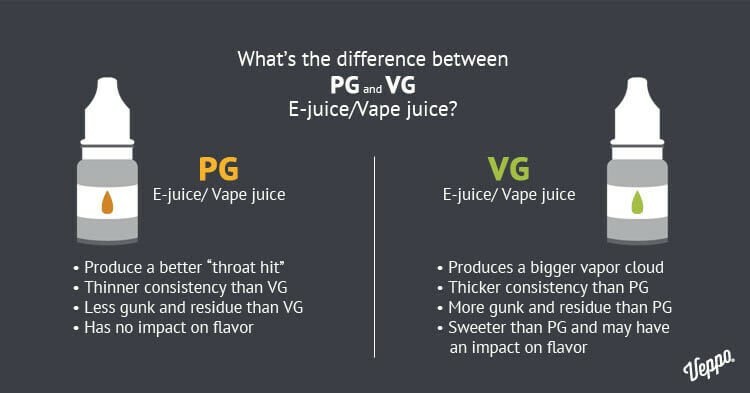 PG is considered to have a much thinner consistency than VG, and it has little impact on flavor. VG, on the other hand, can be sweeter and produce more residue. With the thicker nature of VG, it often provides a more massive cloud of vapor. When choosing the ideal ratio, it's important to consider that a small number of people can sometimes be sensitive to PG. If you have an older style vaporizer or a smaller miniature vaporizer you may also want to consider avoiding VG as the atomizer may be unable to adequately heat the liquid, and it could cause damage. PG can produce a higher degree of flavor and a flavor that can be considered purer than some of the other VG blends. If you do value a large amount of vapor, however, you have got to choose a VG blend. Ultimately the ratio that you decide comes down to your objectives with a vape. Nicotine content can vary in vape juice. It's quite easy to find nicotine content such as nicotine salt which is very high in nicotine down to a 0 mg nicotine free version. The range usually goes from nicotine salt which is the highest in nicotine down to a 3 mg dose. There are intervals from 24, 18, to 12 mg which can help with slowly weaning yourself off the product over time. Choosing your nicotine content can often come down to discovering a flavor that you like and how much you may want to enjoy in each hit from your vape. You can experiment with several types of nicotine content and work at reducing your nicotine content over time. Should you vape or smoke? Why does vape juice make me cough? An e-liquid can on occasion make a person cough especially when they first start using a vaporizer. Some of the top reasons for a coughing sensation is that a vape may be set too high, a high nicotine percentage in the e-liquid could be causing the issue, or a person may have a sensitivity to PG e-liquid.